When states receive foreign outside military support, civil wars last longer. 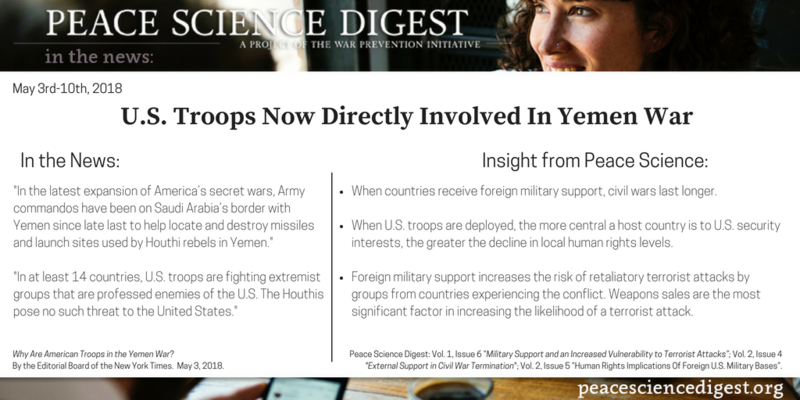 When U.S. troops are deployed, the more central a host country is to U.S. security interests, the greater the decrease in local human rights levels. Foreign military support increases the risk of retaliatory terrorist attacks by groups from countries experiencing the conflict. Weapons sales are the most significant factor in increasing the likelihood of a terrorist attack. Why Are American Troops in the Yemen War? By the Editorial Board of the New York Times. May 3, 2018. Previous article "Trump’s Termination of the Iran Deal is a Risky Bet"...Sanctions Aren't Easy.